Envoy from Lyft looks pretty cool. It's a proxy that runs on every server that facilitates server-to-server communication. 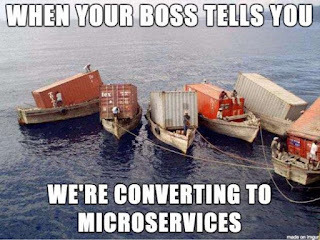 It takes care of all sorts of distributed systems / microservices problems. It implements backoff, retry, and all sorts of other things. It works as a byte-oriented proxy, but it has filters to apply smarts to the bytes going over the wire. It takes care of a lot of the hard parts of building a microservices architecture--namely server-to-server communication. It's written in C++11 for performance and latency reasons. He said that there are a bunch of solutions for doing service discovery. A lot of them try to be fully consistent. These include ZooKeeper, Etcd, Consul. However, he felt that it was better to build an eventually consistent service discovery system.